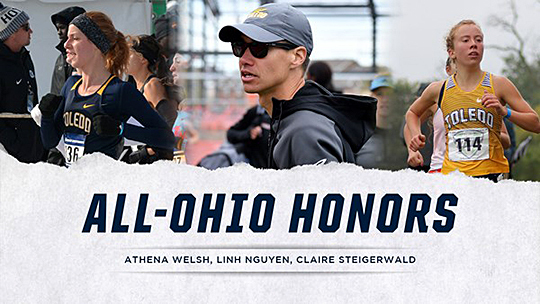 Junior Athena Welsh was voted Division I Female Runner of the Year, freshman Claire Steigerwald was voted Division I Freshman Female Runner of the Year, and UT Head Coach Linh Nguyen was voted Division I Women’s Coach of the Year by the Ohio collegiate cross country coaches, it was announced Feb. 7. Welsh captured first place in three regular-season competitions. The Louisville, Ohio, native hit her personal best at the Bradley Pink Classic, posting a time of 20:36.2 to secure second. Welsh was one second off her personal record at the Mid-American Conference Championship (20:37.9) when she finished second, missing the title by a heartbreaking three seconds, and earning First-Team All-MAC honors. At the NCAA Division I Great Lakes Regional meet, Welsh took 17th place with an NCAA qualifying time of 20:55.2. She then competed in the NCAA Cross County Championships, finishing 85th with a time of 20:59.1. Steigerwald had a breakout season, landing second (14:22.8) in the Toledo Opener and fourth (17:47.0) in the Mel Brodt Collegiate Opener. The Gahanna, Ohio, native was the first freshman to cross the finish line at the MAC Championships, posting a personal record of 21:43.4 to finish 19th and earn Freshman of the Year honors from the MAC. In the NCAA Division I Great Lakes Regional, Steigerwald clocked a time of 22:11.7 to take 80th place. Nguyen coached the Rockets to three first-place finishes on the season. The Rockets had five top-five regular team finishes. In the post-season the Rockets landed second in the MAC Championships and ninth in the NCAA Regionals. Each week, the Rockets consistently placed runners in the top five at their meets. This entry was posted on Friday, February 8th, 2019 at 2:37 am and is filed under Athletics, News .